The Mount Royal, Druid Lake area known today as Reservoir Hill, can be traced back to 1680 when Maryland was being colonized. David Jones left England and came to Maryland claiming land to the east of a small river which ran north to south, cutting what is now Baltimore almost in half. It was on the east bank of this river known today as Jones Falls that David Jones built his home. Other settlers came to Maryland and Jones sold some of his land in an area to the east of the Falls, but the land to the northwest remained a wilderness. The settlement grew into a town and its inhabitants named it Jones Town. In 1730 seven Commissioners appointed by the Maryland Colonial Assembly decided upon a site for a new town, Baltimore. The site chosen was a 60-acre tract north of the harbor and west of Jones Falls. Three streets were located and named after Charles Calvert, the fifth Lord Baltimore. The boundary was irregular, extending from the harbor as far north to a point that is today Saratoga Street, east to Commerce Street and west to Hopkins Place. Baltimore Town grew and many important people came from England and bought or were granted huge tracts of land surrounding it. Charles Carroll of Carrollton, Maryland’s representative at the Continental Congress and signer of the Declaration of Independence, was one of those granted in the late 1700s permission to buy about one thousand acres of land to the north of Baltimore Town and west of Jones Town. Historians believe that the entire area known today as Reservoir Hill was part of the one thousand acres purchased by Charles Carroll. Records show that in 1789, Carroll sold Mount Royal, a subdivision of his estate to Dr. Solomon Birckhead, a Quaker whose family owned a huge estate in what is today Cambridge, Maryland. Dr. Birckhead’s wife was Jane McCulloh whose brother, Hugh McCulloh, owned a large estate southwest of Mount Royal at what is today Lafayette Avenue and McCulloh Street. The Birckhead family owned a home on Calvert Street near Fayette, but they wanted Mount Royal as a summer retreat. Mount Royal was a large estate consisting of all the land between Druid Hill Park on the north, Jones Falls on the east, North Avenue on the south, McCulloh Street on the west, and a huge gray stone mansion known today as the Norwegian Seaman’s Home (at Reservoir Street and Park Avenue). The mansion perched high on a hill, contained 20 rooms and was surrounded by a garden filled with rare plants that extended down to Jones Falls in terraces. In the southeast corner of the estate, at what is today the Jones Falls Expressway, there was a beautiful hill top lake that attracted families from miles around. On Sundays, groups of people could be seen strolling around the base of the hill, while children scrambled to the lake at the top where they could get a view of the entire City. At this time, the area surrounding the Mount Royal Mansion was considered one of the most rural areas in Maryland. 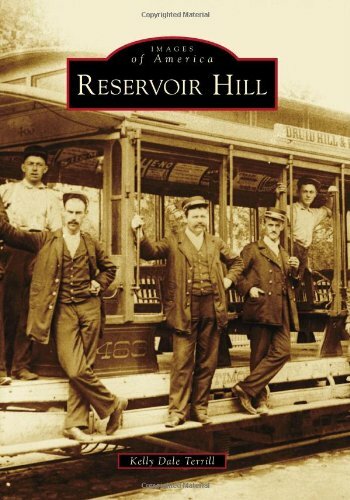 In fact, it was considered so rural that during the Civil War, land that is now occupied by Druid Hill Reservoir was a large cavity where Union troops dumped their dead horses. The site was given the name Horse Haven. Not only was the area rural, it was also beautiful and many Baltimoreans bought tracts of land from Dr. Birckhead for country retreats. Among those who bought land from Dr. Birckhead were Charles and Walter Brooks, wealthy dry goods wholesalers who built Cloverdale in around 1838. Cloverdale included about 150 acres, which extended from what is now Brooks Lane and the bed of the Druid Lake over to Pennsylvania Avenue. As an interesting sidelight, Charles and Walter Brooks allowed Union troops to camp on their estate during the Civil War at approximately the same place Federal troops camped during the riots in 1968. G.W. Gail, a prosperous tobacco firm operator, resided in an estate he bought located on Eutaw Place below Whitelock. His estate, which extended over to Linden Avenue was surrounded by beautiful gardens that featured priceless works of art. Robert Whitelock, to whom Whitelock Street owes its existence, also bought land in Mount Royal. The Whitelock mansion was located on Madison Avenue and was surrounded by a wooded area. Records reveal that Robert Whitelock was a very kind and generous man who was loved and respected by all of his neighbors. Whitelock Street is the result of one of his many kind deeds. Whitelock cut a narrow road through his property for the convenience of a group of tenant farmers living in the woods nearby. Later this road was widened and called Whitelock Street. Enoch Pratt Carroll also bought land from Dr. Birckhead. He owned a woodland area know as Callow Grove, a famous picnic place with a spring located in what is now Bolton Street. People would come from neighboring communities to get fresh water. A fence enclosed the entire picnic area and at sunset the gate would be closed. Two other people who bought land in Mount Royal were General Stricker, a merchant and organizer of the Maryland National Guard, and Robert Garrett, banker and organizer of the B & O Railroad, each of who had equally impressive estates. Dr. and Mrs. Birckhead had three sons and a daughter, Christina. It was to Christina that the remaining Mount Royal estate was bequeathed. Christina married Dr. Thomas Bond, a wealthy physician and they had one son, Hugh Bond, who lived at the Mount Royal mansion for many years after his parents’ death. Hugh Bond, a very colorful figure of his time, was in the 1850s leader of the American or Known Nothing Party in Baltimore. He later supported the emancipation of blacks and was responsible for organizing the first public schools for blacks in Baltimore. Hugh Bond also gave the City one half of the land now occupied by Mount Royal Terrace and Druid Hill Reservoir. The Bond family was well liked by neighbors and the Old Mount Royal mansion was renamed the Bond House. By 1833, residential housing had barely moved into the Mount Royal area. However, in the 1840s the population of Baltimore increased greatly because of industrial development, and a large portion of these newcomers began to migrate north from the inner City in the direction of the Mount Royal area. The area above North Avenue attracted the upper economic classes who constructed big three and four story housesand a number of expensive churches. Many old estates were being converted into institutions or sub-divided, and in 1860, Mount Hope Retreat, a home for the elderly and cemetery was situated at North and Linden Avenue with grounds extending eastward. When it was torn down and new housing was built, there was a superstitious belief that the cellars of the houses built on top of the cemetery were haunted. It was about this time (1860) that Lloyd Rogers, owner of a vast estate to the northwest of Mount Royal, sold a part of his property known as Druid Hill to the City for $500,000 to be used as a public park. The property had previously been landscaped as a private garden and it was full of horse trails, natural lakes, elaborate fountains and pieces of sculpture. The park, a popular attraction for Baltimoreans, contained a huge lake that is today Druid Hill Reservoir. At that time, the lake was 55 acres in extent and about 30 feet deep. Surrounding the lake was a thin path called Gravel Drive where ladies in their long skirts rode sidesaddle with their escorts to the bridal paths in Druid Hill Park. Horseback was not the only means of transportation to the park. Streetcars known as the Old White Line ran from four areas of the City to the entrance of Druid Hill Park on Madison Avenue. At the entrance, a steam car called the Dummy Engine would carry passengers to the interior of the park to the mansion house, a huge pavilion on a hill in the center of the park. The mansion house was a resting place for tired hikers and it still exists today serving somewhat the same purpose. At the mansion house, horse drawn carriages could be rented for three cents. Hiding through the park, wild deer could be seen among the trees while lovers floated slowly around one of the many ponds for boating. The park was divided into nine picnic groves, but one of them was by far the most beautiful. It was the highest point in the park, 360 feet above sea level and called Reservoir Hill. The view from the top of the hill was magnificent and the entire City could be seen clear down to the harbor. In the evening, people leaving the park would often gather around Druid Lake to watch the water in the fountain rise to a great height and fall onto what is now Lake Drive. The park acted as a magnet for residential development, and real estate developers bought up land and divided it into small parcels until only a few scattered estates were left. Streetcar lines were built, including a line connecting the Mount Royal area with the center of the City. The beautiful pavilions, which were once resting places for tired hikers in the park, became waiting stations for streetcars. During the mid 1800s, the City had the power to annex land and many public improvements were made. Jones Falls, previously used as a source of power for various mills along its banks, was used as a water supply for the residents of Baltimore. It supplied the first reservoir built, located at Cathedral and Franklin Streets. Druid Lake and Mount Royal Lake were converted into reservoirs and many streets were constructed or widened. Some of the new streets constructed were Reservoir Street which was cut below the south hill surrounding the Bond House; Madison Avenue, named after the President of the United States, James Madison, after he visited Baltimore; Ducatel Street, named after Jiles Ducatel, chemist, mineralogist, university professor, author, lecturer, newspaper editor and founder of the Maryland Academy of Science and Literature; and Park Avenue which was previously a part of a private estate was opened to the public. Bolton Street was a steep and narrow thoroughfare, which was named after an estate, which stood upon the site now occupied by the Fifth Regiment Armory. It was roped off in the winter for sled races and was widened to accommodate the increasing number of horse and buggies in the area. Garden Lane, a beautiful three-lined street and popular roadway to the park, was also widened causing the destruction of hundreds of huge Linden trees. Garden Lane, known as Linden Avenue, still exists, but the only traces of the huge Linden trees are those which line the 2300 block. By 1896, all of the Mount Royal area had been developed with the exception of the Bond property at the southernmost corner along Mount Royal Terrace; and by 1914, all the Bond property was developed except a few acres surrounding the mansion. In the mid-1900s, the remaining Bond estate was sold to the Monthly Meeting of Friends as a rest home for its aged members. The early 1900s ushered in booming industrial activity and the automobile was introduced. Hundreds of newcomers crowded into the City developing a great need for housing. Large town houses with ten or more rooms were subdivided into apartments while others were cleared to make room for high-rise structures such as the Riviera on Druid Lake Drive, as well as the Emersonian on Eutaw Place and Druid Lake Drive. Most of the new apartments were equipped with modern conveniences such as refrigeration and electricity, which were never before available. These modern apartment houses attracted many more families to the area, and in the 1940s the Mount Royal area began to undergo a physical decline. Concerned homeowners realized that their neighborhoods were deteriorating and decided to try to do something to combat the blighting conditions. As a result of this concern, the Mount Royal Improvement Association was formed. The Mount Royal Improvement Association sponsored clean block campaigns and garden shows, awarding prizes to the neighborhoods with the cleanest blocks and the prettiest gardens. The 600 block of Reservoir Street was known to have had some of the loveliest gardens in Baltimore. The association also acted as a resident participation group in public improvement projects. One such project was the dismantling of the Mount Royal Reservoir. The re-use of the Reservoir was a bone of contention and many proposals were vetoed by the Mount Royal Improvement Association. One suggested use was a public stadium, but it was later proven too small for future population growth. Another proposal was a swimming hole, but that too was turned down because of sanitation problems. Finally, it was decided that it would be filled in and seeded, creating a five-acre lawn, which would stretch from North Avenue to Reservoir Street. The Association also advised homeowners against selling their properties to speculators or subdividing their houses into apartments, and was instrumental in preventing so-called undesirables from obtaining housing in the area. In spite of the protective policy practiced by the Mount Royal Improvement Association, the Mount Royal area continued to decline and World War II came bringing thousands of factory workers into the City. Vacant housing units were almost non-existent and the Mount Royal area became prey for speculators wanting to exploit the situation. The large town houses were further subdivided into many small apartments and rooms without adequate rehabilitation. The wealthy moved northward renting apartments or small homes above Whitelock Street, which had not yet been subdivided, while poorer families moved into increasingly overcrowded conditions. By 1942, overcrowded conditions prevailed and the area continued on a path of deterioration until 1948 when the City undertook the largest housing inspection that it had ever taken. 3,500 houses were inspected and homeowners who lived in the Mount Royal area were shocked to learn about the conditions that existed. Many families moved out of the area completely. Others stayed to try to protect their homes, but in 1948 a crime wave plagued the Mount Royal area. Police protection was increased and neighborhood protective agencies were formed to patrol the streets, however crime was still prevalent. Long time residents gave up and moved out of the area completely. During the 1970s, Reservoir Hill experienced a number of shifts in housing and resident issues. Generally, there was deterioration in housing and a loss of some of the commercial strips in the neighborhood, namely the one located on Whitelock. There was less demand for larger homes and several of the larger homes were converted into smaller units to include individual apartments. This was in response to a wave of low-income residents moving into the neighborhood. Later on, there was a large effort to rehabilitate the neglected homes in the area. Religious organizations began building and establishing themselves within the community. There were a number of individuals who contributed greatly to the neighborhood including Parren Mitchell and those who aided in the establishment of the Reservoir Hill Improvement Council. Major progress occurred when the organization shifted from being volunteer based to being staffed. Also, last year dozens of parents, teachers, students and community residents protested John Eager Howard Elementary being shut down and were successful in their efforts. Arnold, Joseph L. The New Deal in the Suburbs: A history of the Greenbelt Town Program 1935-1954. Ohio State University Press, 1971. Beirne, Francis F. The Amiable Baltimoreans. New York: E.P. Dutton & Company, 1951. Berstein, Amy. Baltimore, 1797-1997. Baltimore; Cherbo Publishing, 1997. Bond, Allen K. Guide to Baltimore and Environs. Baltimore; The Norman, Remington Company, 1926. Brown, Alexander. The Old Bay Line, 1840-1940. New York: Bonanza Books, 1940.